Wherever you go, there are resorts that appeal to families, and others that appeal to couples. The Phoenician Resort in Broadbeach, however, has found a way of appealing to everyone! 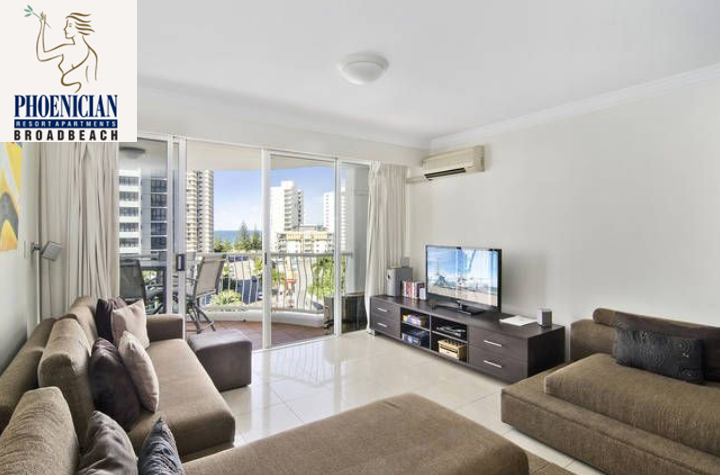 Brilliantly located just 100m from the beach, the Phoenician is perfectly placed for easy access to restaurants, cafes, shops, parks and beaches, theme parks, even the Gold Coast Convention and Exhibition Centre. This makes it ideal for family holidays, romantic weekends away, even business trips, hence the popularity of the resort. Well, that’s actually just one of the many reasons this resort welcomes so many returning guests. As well as being within walking distance of most activities, the Phoenician has clearly put a great deal of thought into both its accommodation, and its facilities. All the accommodation here is excellent, and the configurations suitable for any occasion. The lovely one-bedroom apartments are just right for couples, while the two-bedroom, two-bathroom apartments can easily accommodate a family or a group of friends. Both configurations also include a handy double sofa bed. The standard of accommodation is a huge attraction here, as it really is a home from home. Only top quality appliances have been fitted, and the spacious, air-conditioned apartments include fully equipped kitchens, private balconies and private laundry facilities. It’s well worth regularly checking Gold Coast accommodation specials, as the Phoenician Resort frequently offers some very hot deals. But don’t go thinking for one moment that low prices means low quality! The Phoenician is a AAA 4-Star rated resort, on a par with other resorts, such as Peppers Broadbeach, the Mantra Sierra Grand, and the Aruba Surf Resort. For example, there’s not one, but two swimming pools – and one of them is indoors, so it doesn’t matter what time of year you visit. And naturally, you’ll also discover spas, a sauna, gym, games room and much more, set in the resort’s gorgeous tropical surrounds. It’s those little extras that really count – the secure underground parking, the tour desk, Austar in every apartment, privacy and security. It’s knowing that you can head out in the morning to explore the region or relax on the beach, knowing that you can come ‘home’ at the end of the day to your own private space, with food and drinks in your fridge, and a comfortable queen-sized beach. And it’s the freedom to come and go as you please – the true definition of a perfect holiday. When we go on holiday, we just want everything to be easy, don’t we? We want choices. We want to be as active or as lazy as we want! And we want time to do all those things we dream about, but never get a chance to do. That might be sleeping in, or enjoying a sunset stroll on the beach. It might be a hike through the hinterland, or a day spent reading a book beside the pool. Don’t you owe to yourself and your family to take this time out, to forget about work and chores and responsibility, and just be. 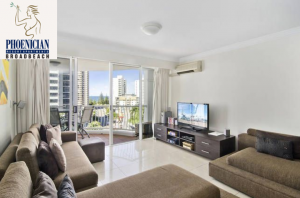 If that sounds good, it’s probably time you checked out Gold Coast accommodation specials for the family at the Phoenician Resort, Broadbeach. Hop online and grab yourself a great deal!